Lawrence Richard "Larry" Csonka (born December 25, 1946) is a former professional American football fullback and a member of the Pro Football Hall of Fame. With the Miami Dolphins he was a member of their perfect season in 1972 and won Super Bowl championships in 1972 and 1973. Csonka was the No. 1 pick by the American Football League's Miami Dolphins in the 1968 Common Draft, the eighth player and first running back drafted in the first round. He signed a three-year contract for $20,000 the first year, $25,000 the second, and $30,000 the third, plus a $34,000 bonus, including a car. Over the next four seasons, Csonka never missed a game, and he led the Dolphins in rushing the next five seasons. Writes teammate Jim Langer, "Csonka had the utmost respect of every player on the team, offense and defense." By the 1970s he was one of the most feared runners in professional football. Standing 6 ft 3 in (191 cm) and 235 lb (107 kg), he was one of the biggest running backs of his day and pounded through the middle of the field with relative ease, often dragging tacklers 5–10 yards. He was described as a bulldozer or battering ram. His running style reminded people of a legendary power runner from the 1930s, Bronko Nagurski. Said Minnesota Vikings linebacker Jeff Siemon after Super Bowl VIII, "It's not the collision that gets you. It's what happens after you tackle him. His legs are just so strong he keeps moving. He carries you. He's a movable weight." He rarely fumbled the ball or dropped a pass. He was also an excellent blocker. The Dolphins had one of professional football's best rushing attacks in the early 1970s. The Dolphins led the NFL in rushing in 1971 and 1972, setting a new rushing record in 1972 at 2,960 yards. Csonka's 1,117 yards that season combined with Mercury Morris contributing exactly 1,000 yards made them the first 1,000 yard rushing duo in NFL history. That rushing attack led the Dolphins to Super Bowls VI, VII, and VIII, with victories in the last two. Csonka's powerful running style set the tone for the ball-control Dolphins. He chose to run through defenders instead of around them, leading to three straight 1,000-yard seasons (1971–1973) and two seasons (1971–1972) in which he averaged more than 5 yards per carry, amazing for a fullback. His 5.4 yards per carry average in 1971 led the NFL. Teammate Bob Kuechenberg said that Csonka was the best back he ever saw for turning a 2-yard gain into a 5-yard gain. "The line got him the start, he got the finish and it added up to 4 or 5 yards every time," said Kuechenberg. In March 1974, Csonka, Kiick and Dolphin wide receiver Paul Warfield, announced they had signed contracts to play in the fledgling World Football League starting in 1975. Csonka signed a three-year guaranteed contract for a salary of $1.4 million. While their signings are credited with giving the WFL credibility, the league was plagued by financial problems right from the start. The three played for the Memphis Southmen, but Csonka and the others had minimal success and the league folded midway through its second season. Csonka carried the ball 99 times for 421 yards for 1 touchdown for Memphis in 1975. The Giants let McVay go after the season ended. Csonka's contract was up, too, and he returned to Miami the next year. He ran for over 800 yards, his best since their Super Bowl days, and rushed for a career high 12 touchdowns while catching one more. 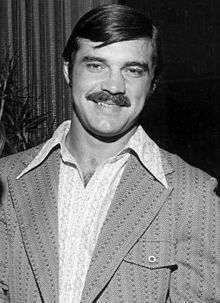 Csonka won Comeback Player of the Year for his 1979 season. On that high note, and unable to come to terms with the Dolphins on a new contract, he retired after the year was over. In his 11 NFL seasons, Csonka carried the ball 1,891 times for 8,081 yards and 64 touchdowns. He also caught 106 passes for 820 yards and four touchdowns. He was among the NFL's top 10 ranked players in rushing yards four times, in rushing touchdowns five times, total touchdowns three times and yards from the line of scrimmage once. He earned All-AFC honors four times and was named All-Pro in 1971, 1972, and 1973. He was also selected to play in 5 Pro Bowls. Since his retirement, he has become a motivational speaker and has hosted several hunting and fishing shows for the NBC Sports Network (formerly OLN and Versus). He worked for the United States Football League (USFL) Jacksonville Bulls in the mid-1980s, first as director of scouting and then as General Manager. Csonka was also a color analyst for NFL games on NBC in 1988, and an analyst on the syndicated show American Gladiators from 1990–1993. From 1998 through 2013, 16 years Csonka was Producer and co-host of Napa's North to Alaska, before retiring the show. Csonka also did Csonka Outdoors, 1998-05 on ESPN-2 and OLN. In early September 2005, Csonka and five others were returning by boat to the village of Nikolski on Umnak Island in Alaska's Aleutian's after filming a reindeer hunt on the island for Csonka's TV show, North to Alaska. The boat was caught in a severe storm and nearly capsized. They rode out the storm for 10 hours before a U.S. Coast Guard helicopter could reach them and rescue them one-by-one in a basket. 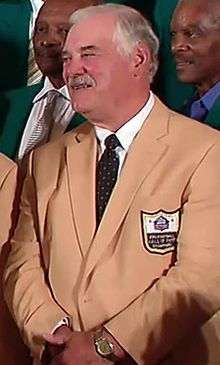 In November 2013, Csonka was recognized by the Pro Football Hall of Fame as part of “Hometown Hall of Famers,” a national program honoring the hometown roots of the sport’s greatest coaches, players, and contributors with special ceremonies and plaque dedication events in local communities. Csonka was presented with a plaque during a ceremony in the Stow High School gym, where the plaque will stay permanently to serve as an inspiration for the school’s students and athletes. ↑ "Pro-Football-Reference Larry Csonka". Retrieved 2007-07-20. ↑ "High school notebook: Larry Csonka to earn honor at Stow on Monday". Akron Beacon Journal. November 20, 2013. Retrieved November 28, 2013.